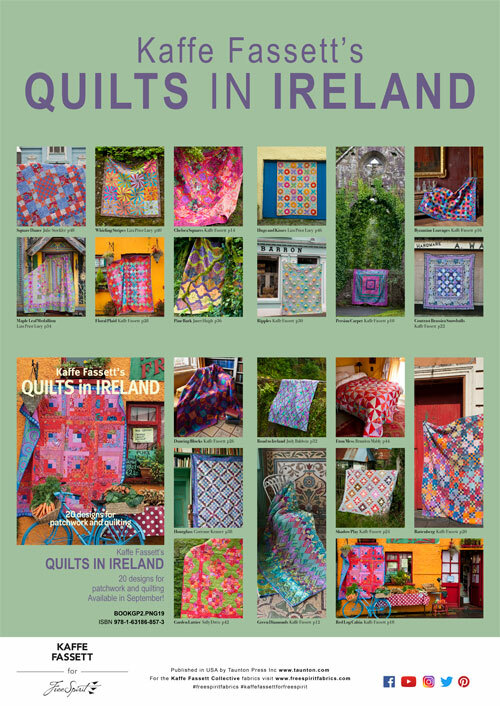 Kaffe Fassett’s Quilts in Ireland has a range of 20 great projects inspired by the brilliant colours of Western Ireland. Each of the quilts featured in this book is made using new fabrics from the Kaffe Fassett Collective as well as Kaffe’s long standing favourites from his other fabric collections. These options give quilters the perfect choice of colour-coordinated motifs that reflect the diversity of western Ireland. The soft tones of Kaffe’s Green Diamonds quilt blend perfectly with the delicate mosaics of the historic Glenville House, while the rich dark tones of his Persian Carpet design sing out against the gothic ruins of a former chapel.